Reach for the sky with this fragrant and colorful mix of roses, carnations and mixed blooms thats sure to impress. For a birthday, congratulations or just because. 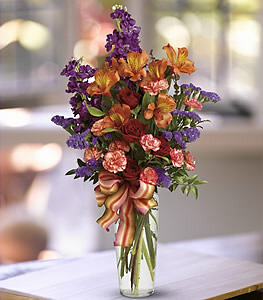 Red spray roses, orange miniature carnations and alstroemeria, purple stock and sinuata statice, and huckleberry are delivered in a clear glass vase adorned with a striped satin ribbon.